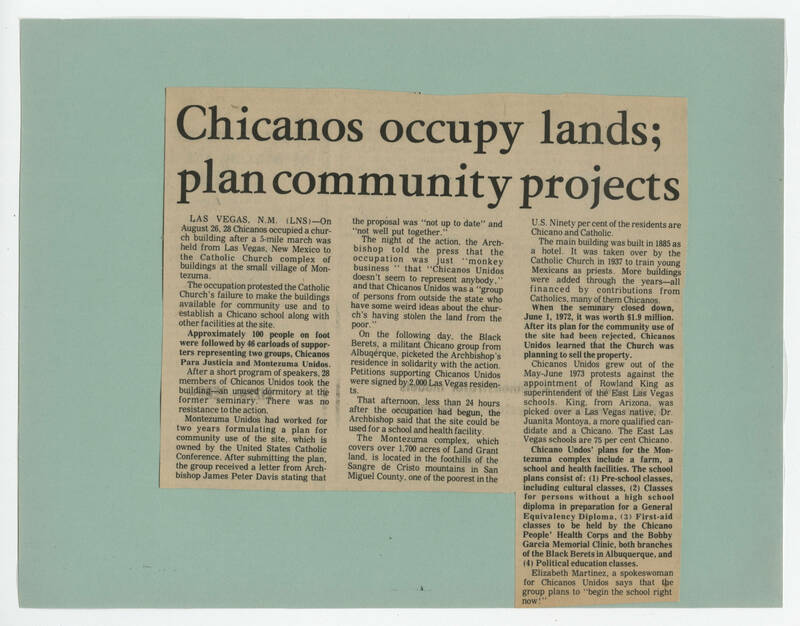 [[Headers]]Chicanos occupy lands; plan community projects[[end header]] LAS VEGAS, N.M. (LNS)--On August 26, 28 Chicanos occupied a church building after a 5-mile march was held from Las Vegas, New Mexico to the Catholic Church complex of buildings at the small village of Montezuma. The occupation protested the Catholic Church's failure to make the buildings available for community use and to establish a Chicano school along with other facilities at the site. [[bold]]Approximately 100 people on foot were followed by 46 carloads of supporters representing two groups, Chicanos Para Justicia and Motezuma Unidos. [[end bold]] After a short program of speakers, 28 members of Chicanos Unidos took the building--an unused dormitory at the former seminary. There was no resistance to the action. Montezuma Unidos has worked for two years formulating a plan for community use of the site, which is owned by the United States Catholic Conference. After submitting the plan, the group received a letter from Archbishop James Peter Davis stating that the proposal was "not up to date" and "not well put together." The night of the action, the Archbishop told the press that the occupation was just "monkey business" that "Chicanos Unidos doesn't seem to represent anybody," and that Chicanos Unidos was a "group of persons from outside the state who have some weird ideas about the church's having stolen the land from the poor." On the following day the Black Berets, a militant Chicano group from Albuquerque, picketed the Archbishop's residence in solidarity with the action. Petitions supporting Chicanos Unidos were signed by 2,000 Las Vegas residents. That afternoon, less than 24 hours after the occupation had begun, the Archbishop said that the site could be used for a school and health facility. The Montezuma complex, which covers over 1,700 acres of Land Grant land, is located in the foothills of the Sangre de Cristo mountains in the San Miguel County, one of the poorest in the U.S. Ninety per cent of the residents are Chicano and Catholic. The main building was built in 1885 as a hotel. It was taken over by the Catholic Church in 1937 to train young Mexicans as priests. More buildings were added through the years--all financed by contributions from Catholics, many of them Chicanos. [[bold]] When the seminary closed down, June 1, 1972, it was worth $1.9 million. After its plan for the community use of the site had been rejected, Chicanos Unidos learned that the Church was planning to sell the property. [[end bold]] Chicanos Unidos grew out of the May-June 1973 protests against the appointment of Rowland King as superintendent of the East Las Vegas schools. King, from Arizona, was picked over Las Vegas native, Dr. Juanita Montoya, a more qualified candidate and a Chicano. The East Las Vegas schools are 75 per cent Chicano. [[bold]]Chicano Undos' plan for the Montezuma complex include a farm, a school and health facilities. The school plans consist of: (1) Pre-school classes, including cultural classes, (2) Classes for persons without a high school diploma in preparation for a General Equivalency Diploma, (3) First-aid classes to be held by the Chicano People' Health Corps and the Bobby Garcia Memorial Clinic, both branches of the Black Berets in Albuquerque, and (4) Political education classes. [[end bold]] Elizabeth Martinez, a spokeswoman for Chicanos Unidos says that the group plans to "begin the school right now!"